lots of room for 2 families to enjoy. We have decorated the condo with a beach and tropical theme for your home away from home. meal. Then relax in our spacious condo with over 1800 Square Feet of living space with vaulted ceilings. This is a top floor condo so you have no restrictions to your view of the lake or the stars at night. 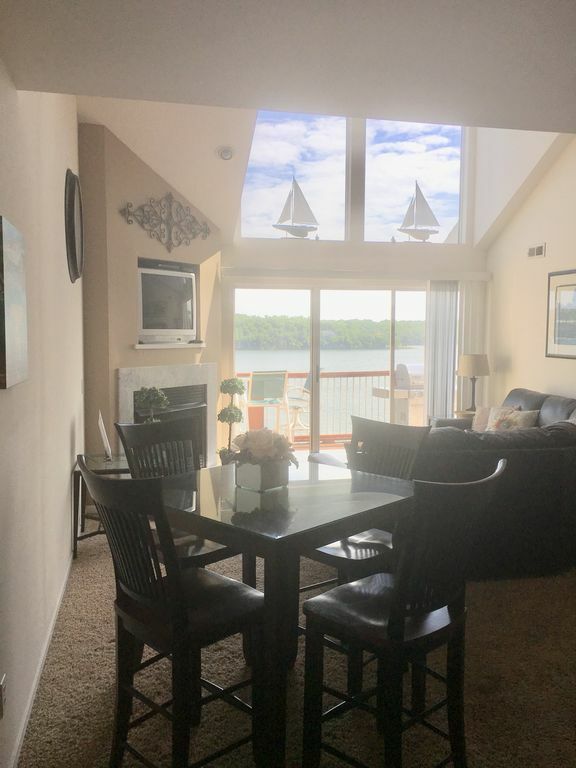 We are minutes from the main Highway (Hwy 54) that will take you to all the fun places the Lake of the Ozarks has to offer such as: Golfing, Shopping at the Outlet Mall, Restaurants and Tan-Tar-a Indoor Water Park.The State Park is only minutes away. This Condo is perfect for two or three families that includes a king-size bed in the masterbedroom and private bathroom, queen-size bed in second bedroom and the third bedroom. The second and third bedroom share the second bathroom. The fourth bedroom is located upstairs with a queen size bed and full bathroom. The loft area is furnished with 2 twin beds and a couch. All bedrooms, living room and loft have ceiling fans and televisions are in the living room, the master bedroom and upstairs 4th bedroom. The condo is located at the 20.5 Mile Marker and sits on the bank of the Main Channel. There are two pools to choose from, One on the Point with a fantastic view of the Main Channel and the other located near the entrance of the Complex. Also available for Swimming is a Beach area with a Playground and Volleyball Net. For Ladies weekend, all the shopping at the Lake is close by! The Lake of the Ozarks hosts the Factory Outlet Village, the largest outlet mall in the State with over 110 factory direct outlets. These stores are always having a sale to draw you in. We also have a great Marshall's, Pier One and Target that have great bargains. The Ledges Condos are a very popular rental because it is located so close to everything: golf, shopping, restaurants, Big Surf, Tan-Tar-a Water Park, go-carts, grocery stores and a hospital. There are marinas nearby for your boat and Wave Runner rental needs. The state park is just a short drive away and offers very nice ramping facilities as well as short to long-term trailer parking for your boat or personal watercraft trailer. By water, you'll be on the 20.5 mile marker which is just around the corner from the Grand Glaize Bridge. THERE ARE NO ELEVATORS IN ANY OF THE BUILDINGS AT THE LEDGES. Please No Pets or Smoking Allowed.Evidence or Report of Pets or smoking in condo will result in forfeiture of Deposit. Renters must be 25 or older to rent this condo. Keywords: Condominium on Top Floor! In extreme heat please keep all outside doors closed at all times. If you leave them open you are inviting the excess heat in as well as bugs from the outside.Keep sliding doors closed at all times. At the end of your stay please leave sheets on beds and check for personal items that they are not left in or under beds, drawers or closets. Please do not put any towels or other clothes in the washer or dryer without first shaking out any sand or dirt from the beach area. Fireplace is not accessible to renters due to insurance reasons. Parking is available in front of the condo area. Only during the Holiday weekends are you going to need the parking permits which we will provide 2 per unit. Additional cars must park on 3rd tier. All dirty or wet towels can be left on floor of bathrooms or in laundry baskets by the washer. The condo seats 4 at the table and an additional 3 at the bar. Outside is an additional 8. TV in living room, Master bedroom and bedroom up in the loft. Sorry but there are no elevators in the Ledges Complex. (2) Pool at the front of the complex near beach. Second pool facing the point of the property facing the main channel. Both pools have bathroom facilities. No glass bottles of any kind are allowed. Enjoyed the condo very much thank you. Thank you for your review. We always enjoy hearing back from our guests! watching all the boats go by. Glad everything worked out for you and your friends. Our stay at your condo was absolutely awesome. We enjoyed our stay at your condo. We had a great time on the lake, at the pool, shopping and go carting. Every place was easy to get to and the weather was great. Thank you and we hope to enjoy your condo next year. We are so happy that your stay at our condo was so enjoyable. We are always glad when people let us know if everything went well. Come back any time! 6 adults & 2 children. Enough room for all of us & we all had a great stay. The owners were very responsive & accommodating. It is quite a walk up/down hill from the beach & docks. The view of the main lake is great also. When we first arrived, we thought it was really nice - and in a lot of ways, it was. The temperature outside was more than miserable, but it seemed to be cool and comfortable. However, as time went by, the temperature inside the unit began to get warmer and warmer - it ended up being 90 + degrees. We were aware not to touch the thermostat and, in so far as I know, (there were 10 of us)... no one did. After a while we called the owner and after some discussion we were advised that the temp would be re-set. The biggest complaint that we had is that we had NO control over the thermostat - I understand perfectly the reasons for the owner's desire to maintain control, but we were very uncomfortable with the heat. The unit will sleep 10, but the kitchen is so small that there is really only room for one person at a time. There is no place for all 10 people to eat together - just have to find a seat where you can. This review is not meant to harm anyone, rather its our own opinion. Thank you for commenting on the cleanliness and the great view of the condo. and said when it's this hot it is hard for the unit to keep up but it was working. it was never over 78. As the pictures on the website show we have a full size kitchen that looks into the living room and there is plenty of room for a couple of people to prepare meals. the temperature inside. We thought the NEST was going to work for us but we went back to the old school thermostat until we can figure out something else. the extremely heat we had during your stay. We had a great stay. Great condo! We had a great experience at this condo. It couldn’t have been better! You taking the time to review our property! loads of night life throughout the Lake area. There are even cab services available for nights out. Also plenty of excellent breakfast establishments for your morning coffee and cinnamon rolls or eggs and bacon. To book the dates you are requesting we would need a $200.00 security deposit sent once we have agreed on the dates. We would prefer a check for the deposit.